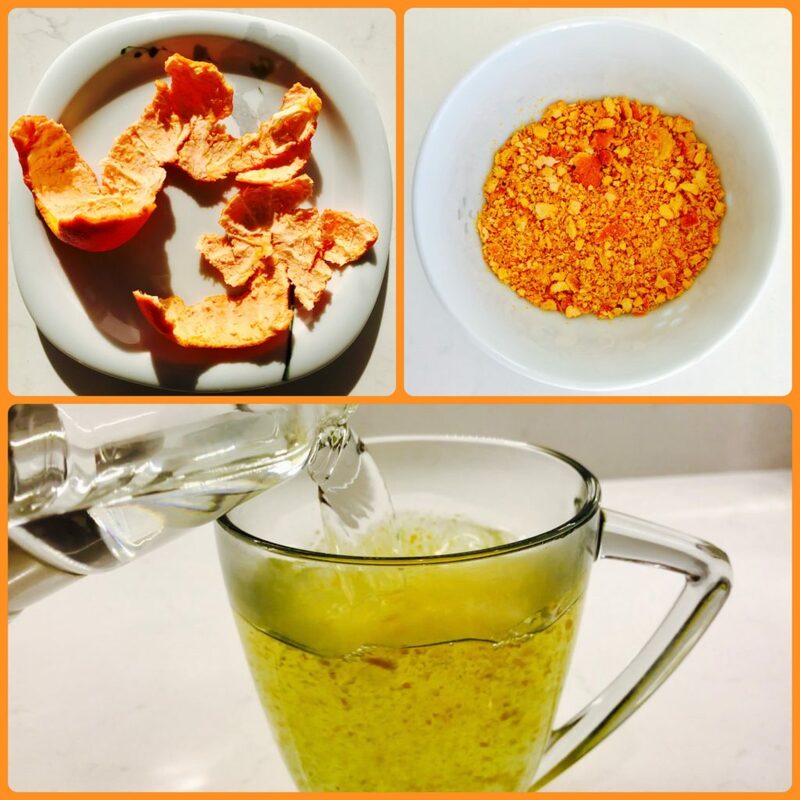 Surely you’re familiar with the tangerine (aka mandarin), with it’s sunny orange hue and juicy, vibrant burst of sweet citrus flavor, but did you know that you can use the peel of the tangerine to make a delicious tea, which can help to soothe what ails you? Read on to learn why this is the perfect time of year to incorporate this elixir into your routine. I am so excited and honored to be an expert speaker today on The Healthy Travel Global Summit hosted by Dr. Robyn Benson! It brings together over 30 highly respected, heart-centered medical experts who share their vast expertise about how to travel consciously and healthfully. Bed bugs are more common than you think! 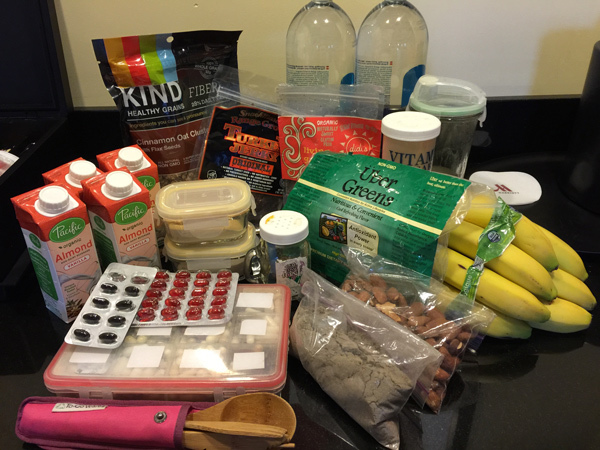 And you won’t want to miss my “Show and Tell” time where I will pull out all of the essential goodies from my Healthy Traveler Paraphernalia kit! Oh, one more thing! Because I absolutely love to serve you the best way I can, when you register today you will receive in your inbox by tomorrow…. This is the very first time I have ever shared my personal tips, tricks and details of how to prepare for healthy travel, including a list of exactly what to take on the flight as well as which supplements to pack so that you can make each business trip or adventure the very best– full of boundless energy, sharp mental focus and maintain a powerful vibrant body! Only you and my private health community will get this opportunity to grab my personal checklist, so don’t miss out, Register Now! When you do, you’ll instantly download more than $1500 of bonuses, including access to a private Facebook Group where all of the Summit speakers and participants can connect. You’ll love what the remarkable health experts and travelers share. 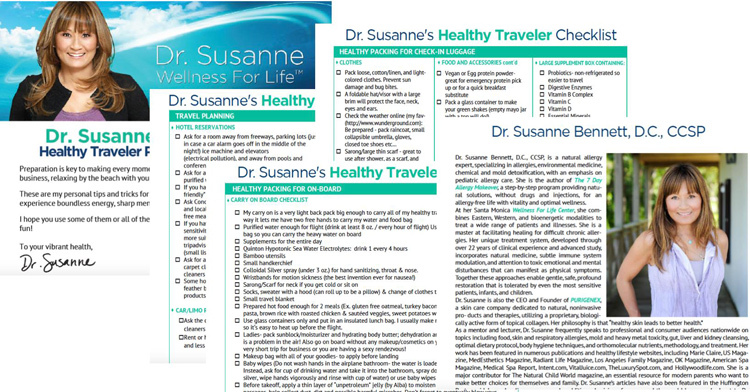 Register now to watch my interview with Dr. Robyn and for the rest of the ground breaking summit and you will get my personal thank you gift: Dr. Susanne’s Must Haves: Healthy Traveler Paraphernalia Checklist! https://drsusanne.com/wp-content/uploads/2015/05/Dr-Susanne-Robyn-Benson1.jpg 321 1000 Dr Susanne https://drsusanne.com/wp-content/uploads/2018/04/logo-sample-300x100.png Dr Susanne2015-05-04 08:10:512015-07-10 11:43:33Show and Tell Time! You probably don’t know this about me, but I get so excited in the springtime because it’s when I start planning my next big summer vacation! Yippee! 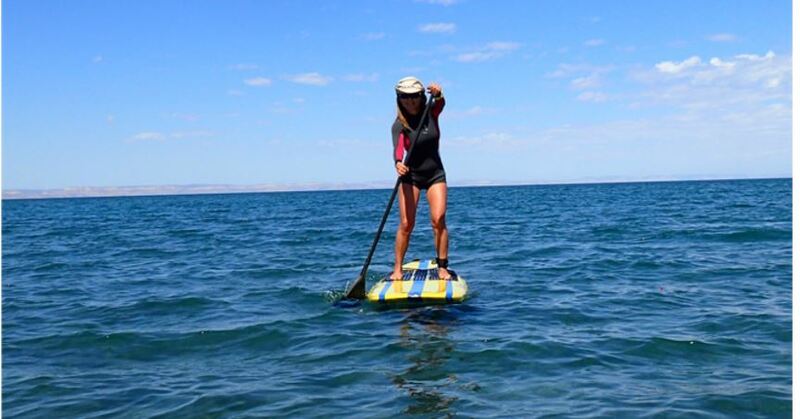 I just LOVE to travel to other parts of the world where I can jump into the ocean to swim, snorkel or stand up paddle. I’ve actually lived near the ocean my entire life… from Korea, to Monterey and now the Pacific Palisades, and I have a deep love and respect for the ocean and marine life. 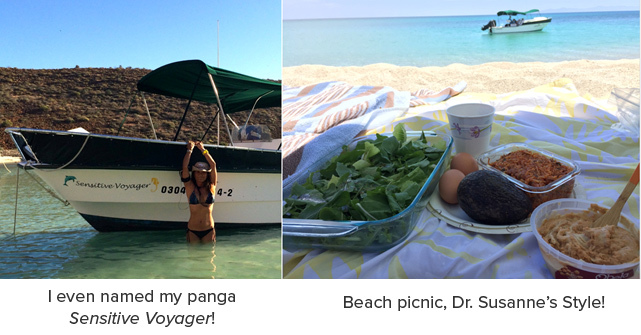 In fact, my family and close friends call me the “Sensitive Voyager ” – not only because I have a strict rule to explore beaches and oceans wherever I go, but also because of the “way” I travel. I’m very organized and prepared with all of my food, supplements and healthy travel paraphernalia. My philosophy is that I want to have the best experience possible at every moment in my life – including during my travels – and if it takes an extra bag of goodies to do that, I am all for it! Preparation is key for healthy traveling, whether it’s for a business trip or a fun-filled adventure. 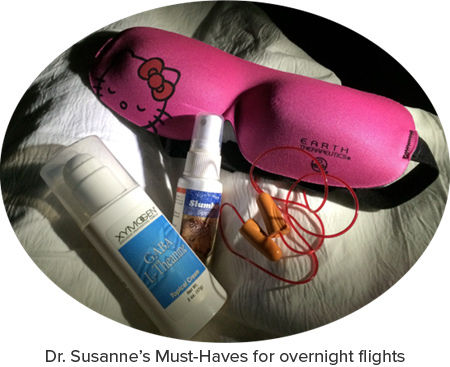 On Nature’s Secrets today I will share my top healthy travel essentials for you and your family, so you can maintain your energy and mental focus, be free of allergies and avoid any potential health disasters that are so common for people when they travel. First let’s pack a Healthy Travel Paraphernalia Kit for you! Daily essential supplements of vitamins and minerals allow you to travel guilt-free – you may not be getting enough fresh vegetables and fruit backpacking in the Alaskan wilderness. Which ones to take? 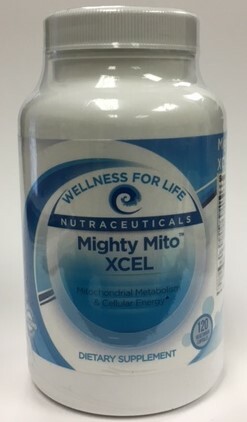 A Multi-vitamin and mineral formula for sure and take extra Vitamin C and Vitamin D for extra energy and immune boosters. Also important are probiotics that you don’t have to refrigerate, especially in areas that commonly cause traveler’s diarrhea such as South America, Asia and Africa! Tropical environment means more exotic insects that can bite you! Wear light long sleeve shirts and long pants to protect your body and pack a mosquito netting for your bed. Dengue fever is more common than you think! Don’t forget non-DEET bug repellent you can apply to your skin found at your local health food store. It will keep the mosquitoes and sand flies away. Another great bug repellent is Magnesium oil! This was my own discovery while I was traveling in Mexico. 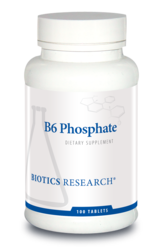 They hate the taste of it, and at the same time you can have extra Magnesium that will absorb though the skin. A “green” or eco-friendly hotel could be more suited for your family – those are more conscientious about chemicals and allergen that can be aggravating to your health. Today, many hotels and restaurants all around the world now accommodate for the sensitive traveler. Even if you do not have allergy symptoms, being mindful of your environment and nutrition will make your travels so much more enjoyable and memorable. Hotels are now equipped with air purifiers, feather free bedding, non-chemical cleaning products, you just need to ask for it. Also, check if the resort is “pet friendly.” You don’t want your sensitive child sneezing and coughing through the night. Weather or not? Look online for the weather of your destination; you can see the next 10 days, but also check out the average temperatures for the month, including the ocean’s water temperature. I take my snorkel gear, shortie wetsuit and underwater camera on every trip! Travel with healthy snacks! I love packing foods that will sustain my energy and brain power, just in case we are stuck somewhere without a decent restaurant. Worst situation is when a child is hungry! We all know that a hungry child is not a happy child! What are my healthy snack favs? Bring on board plenty of purified water- drink 8 ounces of water for every hour you are up in the air. Flying dries your eyes, nasal and lung tissues as well as your skin! Colloidal silver throat spray for before, during and after flight to ward off viral and bacterial infections. Before boarding your flight, apply a thin layer of “unpetroleum” jelly to moisten and protect nasal passages – It will keep nasal passages moist, help collect dust, dirt and possible harmful microbes. Don’t forget to eventually blow your nose after the flight! Socks and a scarf. Even if you are dressed appropriately to go to the islands, the plane ride can be brutally cold. Covering up will prevent you from catching a draft and weakening your immune system! If you are flying to a different continent, best to make your flight arrangement over night so you can wake up fresh and ready to go when you arrive at your destination! Don’t forget to bring on board loose & comfortable clothing to sleep in such as long sleeve shirt and sweats, it can get very cold in the plane! Also pack your eye mask, earplugs and natural sleeping formulas such as gaba cream and melatonin with 5-HTP to help you relax and get deep uninterrupted sleep of at least 7-8 hours. The worst flights are when you can’t get the rest you need and half of your vacation is trying to get used to the jet lag! Again, preparation is key for healthy travel! When you do, you’ll have the best experience wherever you go! Isn’t having fun what it’s all about? Bon Voyage! Join me on the Healthy Traveler’s Global Summit! With spring finally here and days are getting longer, temperatures will continue to rise with warm sunshine and clear blue skies. So, before stepping outside, we want to be mindful about sun protection, and should apply the correct formula that protects our skin and your children’s delicate skin, particularly in the areas that a prone to sun exposure and damage, such as your face, shoulders and chest. Here I am all covered up under the hot La Paz sun! With so many different brands available as well as various types of chemicals in sunscreens and sun blocks, you may feel overwhelmed and often have difficulty choosing the right type of formula or SPF. I am going to make it easy for you and give you the details on which best sun care formulas to get and some tips and tricks in natural sun protection. 1. First let me give you some Sun Facts! The sun emits two types of ultraviolet light that affect human skin, UVA and UVB. UVB is much stronger than UVA, and it has an immediate impact on skin, within 60 seconds. It is most powerful during the summer and especially between the hours of 11 a.m. to 4 p.m. UVB is completely blocked by glass (windows) whereas UVA radiation penetrates through glass and windows and can cause damage to the skin even during cloudier days. Although UVA is lower in intensity and is not felt by the skin, it is the main cause of premature skin aging (wrinkles, sagging and age spots) and possibly skin cancer. I have to tell you that a few weeks ago when I was in Miami for a conference, I actually got a second-degree burn on my skin! I acted quickly and healed my blisters and pain in one hour, so miraculously that I got so inspired and made a 4 part Skin Secrets miniseries that goes into detail on how to heal damaged skin from the sun and premature skin aging. You can go to drsusanne.com/miniseries to get the free 4 part Skin Secrets miniseries! 2. What does SPF mean? It stands for Sun Protection Factor. SPF numbers are designed to describe the length of time you can stay in the sun before you start burning your skin. For example, if you normally start to burn after 30 minutes of direct sunlight, then an SPF 30 product should let you stay in the sun for approximately 30 times longer without burning. What is the difference between sun blocks and sunscreens? Both formulas protect our skin from sun damage by different mechanisms. Sun blocks actually sit “on” the skin and act as a barrier to reflect away ultraviolet (UV) rays — both UVA and UVB radiation can cause sunburn and skin damage, and possibly even skin cancer. So it “BLOCKS” the sun UV rays from penetrating into the skin and damaging the delicate tissue. Zinc Oxide and Titanium Dioxide are both sun blocking agents for both UVA and UVB rays. Sun blocks usually start at an SPF (Sun Protection Factor) of 15 or higher. All SPF ratings apply only to UVB protection, not UVA. In comparison, sunscreens are made with chemicals that absorb and neutralize the ultraviolet radiation. Sunscreen chemicals typically protect against either UVA or UVB, while only a few protect against both types of radiation. As a result, sunscreens usually have mixtures of both kinds of chemicals in order to be labeled as “broad spectrum” — and to be fully protective. The SPF levels of sunscreens are widely varied, starting as low as 2 and rising as high as 100+. I have big concerns about chemical sunscreens acting as endocrine disruptors — compounds that mimic hormones and activate hormone receptors. Some studies have indicated that these chemicals may generate free radicals that can damage skin and possibly cause skin cancer. 3. Go for the sun blocks rather than the sunscreens. I always suggest using sun blocks rather than sunscreens. Look for formulas that have either zinc oxide or titanium dioxide in them. Out of the two, zinc oxide causes fewer allergic reactions. These are natural mineral compounds that will “block” the UV rays from penetrating the skin; the only drawback I know of is that they may leave a white residue.I suggest staying away from products claiming they use “nano-particles” (between 1 to 100 nanometers), which can penetrate skin. Don’t forget to follow product warnings for infants under 6 months old. I believe in avoiding synthetic estrogen compounds, which appear under names such as oxybenzone (benzophenone-3 and 4-methyl-benzylidene camphor (4-MBC), as well as other derivatives that are super free radical generators (causing skin damage) such as avobenzone, Parsol 1789, dioxybenzone, ethylhexyl p-methoxycinnimate, 2-ethylhexyl salicylate, protamine salicylate, homosalate and PABA. Also avoid—Sunscreens with added insect repellents such as deet and permethrin, they are super toxic and can cause damage to you and your child’s nervous system. Purchase cream-based products only. Avoid sprays and powders, as the vapors and particulates can easily be inhaled and irritate nasal passages and respiratory system. Use an SPF of at least 15 — and apply plenty of it often. Before using any sunscreen or sunblock, test it by applying a small amount to your child’s wrist. If the skin turns red, itchy or irritated within 20 minutes, try another brand. 4. 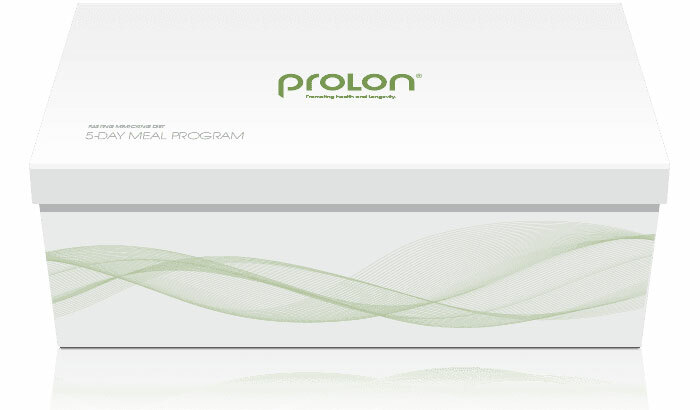 The best defense from damaging UV rays is prevention. Wear loose, cotton/linen, and light-colored clothes. Long sleeve shirts, pants and dresses will reduce UV rays from penetrating the skin. A good hat with a large brim will protect the face, neck, eyes and ears. If you are a water sports lover like I am, wear a rash guard or even full-body rash guard/swimsuit. It also works beautifully for children who love to be in the water for hours at a time. Use a hat that can be cinched down under the chin. Play in the shade. Use a parasol or umbrella at the beach or park, and keep infants completely out of the sun: sunscreen should not be used under six months of age due to their sensitive skin. In addition, infants under the age of 12 months do not have enough melanin, a protective pigment in skin that helps block out UV rays. Schedule indoor or shaded play dates around the peak sun hours 11 a.m. to 4 p.m. Wear polarized sunglasses to prevent skin damage around the eye and cataracts. Do attach the glasses to straps, so you don’t lose them! Use removable mesh window shields to keep direct sunlight from coming in through the windows of your car. Eat organic foods high in antioxidants to build up your “internal sunscreen”, including fresh vegetables, dark greens and fruits such as berries, pomegranate, acai and goji berries. For children who shy away from veggies, give them a daily antioxidant supplement loaded with Vitamin C, Vitamin E and greens. We do need our daily dose of vitamin D, but on sensitive areas that are well known to grow skin cancer, such as your face, chest and shoulders, do use the best form of sunblock to prevent premature aging and sun damage and definitely to keep your healthy glowing skin! While you’re at it, grab your hat before going out too! BTW: Don’t for get to join me on the Glowing Skin Summit, it starts today, April 27, 2015! Is Our Genetic Blueprint A Conspiracy Theory? From Dr. Mitchell Gaynor, a renowned oncologist and pioneer in integrative medicine, comes a revolutionary approach to healing at the genetic level: preventing cancer, heart disease, and diabetes; increasing brain function; and reversing habits that lead to obesity and premature aging. Mitchell Gaynor, M.D. is the founder and president of Gaynor Wellness and a clinical assistant professor of medicine at Weill-Cornell Medical College with more than twenty-five years of experience treating patients. His work has been featured in The New York Times and he has appeared on many national television programs, including Good Morning America, The Dr. Oz Show, and The Martha Stewart Show. He lives in New York City. While conventional medicine focuses on treating symptoms with prescription drugs, Dr. Mitchell Gaynor’s pathbreaking plan goes straight to the most fundamental level: our DNA. We cannot alter the genes we are born with, but we can change how they are expressed over the course of our lives through targeted foods and supplements. The Gene Therapy Plan presents clear and evidence-based approaches to diet, including juices, recipes, and menus. Empowering and informative, with inspiring stories from Dr. Gaynor’s decades of clinical practice, this forward-looking book by the author of Nurture Nature, Nurture Health puts our genetic destiny back into our own hands. Contrary to popular belief, our genetic history does not spell out our destiny. We all know that we inherit half of our genes from each parent, but most of us don’t realize that the expression of these genes changes over our lifetimes—and that by eating targeted, healthy foods and making smart lifestyle choices, we can actually alter our genetic blueprints and significantly reduce our risk of developing serious health problems like cancer, heart disease, and diabetes and reverse habits that lead to obesity and premature aging. The Gene Therapy Plan makes this science accessible to readers everywhere. This is the future of medicine, and Dr. Gaynor gives readers access to the tools they need to put these new discoveries into practice. The medical community is abuzz about this book—Deepak Chopra, Dr. Mark Hyman, Dr. Sheldon Marc Feldman, Dr. William Li, Dr. Christiane Northrup, Dr. Mimi Guarneri, and Devra Davis have all praised the book, and Dr. Mehmet Oz wrote the foreword. The results Dr. Gaynor has achieved with his patients are nothing short of remarkable. 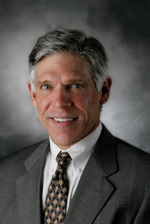 Dr. Parker is the Medical Director of the Parker Center for Plastic Surgery in Paramus, NJ. He is board certified by the American Board of Plastic Surgery and holds a certificate of advanced education in cosmetic surgery. 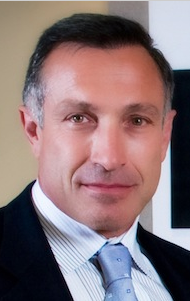 He is a Fellow of the American College of Surgeons and an active member of the American Society of Plastic Surgeons, the American Society for Aesthetic Plastic Surgery, the Northeastern Society of Plastic Surgeons, the American Society for Laser Medicine and Surgery, and the New Jersey Society of Plastic Surgeons. Before stepping outside, we want to be mindful about sun protection, and should apply a formula that protects our skin and children’s delicate skin. 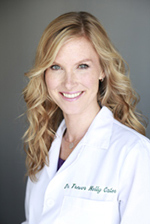 On Nature’s Secrets, Dr. Susanne will talk about the differences between sunscreen and sunblock, and which one is the safest and least toxic as well as other natural sun protection strategies! Allergy Season is already here! Sunny skies, drier and warmer temperatures in some areas of the country allow plants and trees to bloom earlier releasing an abundant amount of pollen for the natural process of propagation. Southern California is one of those areas that are experiencing early allergy season. “Cedar fever” in some areas of Texas will be affecting thousands of people soon. According to the Asthma and Allergy Foundation of America, 40 million Americans suffer from symptoms of seasonal allergic rhinitis commonly known as hay fever. Pollen irritates the mucous membrane tissues in our eyes, nasal/sinus pathways and oral cavity causing itchy eyes, nose and throat, sneezing, post nasal drip, cough, fatigue and in more severe cases, asthmatic reactions. There are many natural remedies for children and adults that work surprisingly well to relieve allergy symptoms from outdoor seasonal inhalants. Here are a few supplements to add to your natural remedy emergency kit that can be easily found at your local health food store or holistic pharmacy. Using these remedies individually or in combination may help alleviate your or your child’s symptoms and also prevent future reactions. Stinging Nettles: Nettle leaf extract contains compounds that reduce inflammation and histamine production. Bromelain: a natural enzyme from pineapple and an effective anti- inflammatory when taken on an empty stomach. Black Currant (Ribes Nigrum) Gemmotherapy: Gemmotherapy formulas are plant stem cell extracts from buds and shoots of organic plants. Extremely powerful in minute doses, black currant extract is known as the “natural cortisone” to help alleviate inflammation and allergic symptoms. 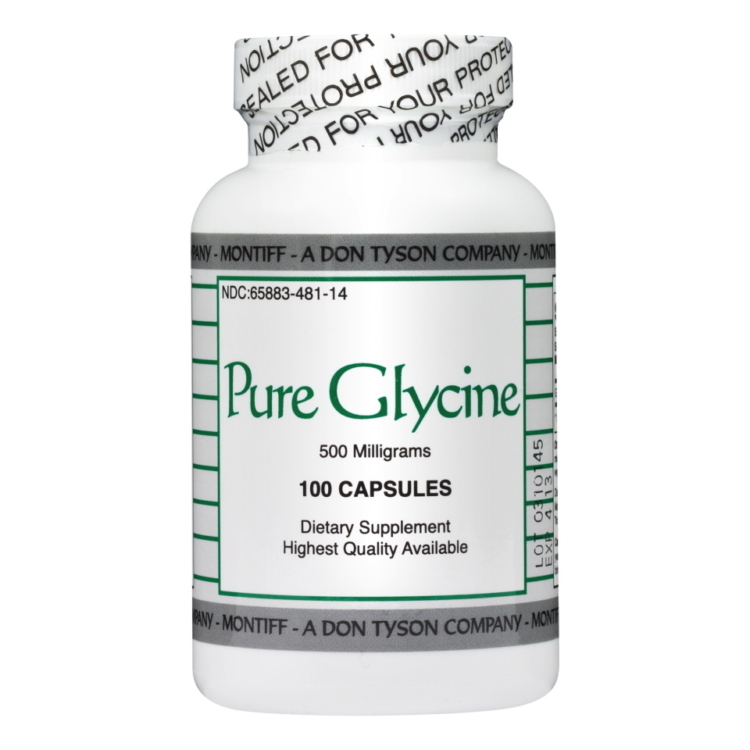 Pycnogenol: A study (June 2010) by Dale Wilson et al, in Phytotherapy Research concluded that pycnogenol (pine bark extract) taken 5 weeks prior to allergy season improved allergic rhinitis symptoms. This super anti-oxidant can reduce symptoms of inflammation, runny nose and itchy eyes. Homeopathic Lymph Drainage cream: helps drain and open the lymphatic system of the head and neck to remove metabolic waste and secretions, ultimately alleviating nasal congestion, runny nose and postnasal drip. 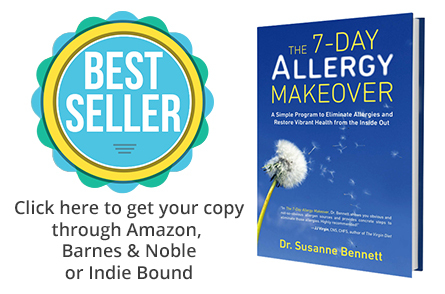 Reduce common food sensitivities that can increase histamine and mucus production such as dairy, yeast, sugar and soy. Keep windows closed during the seasonal months of March through June and from September to October. Invest in a whole house air filtration system or a HEPA air purifier for your child’s room (do not use a negative ionizer, not as effective in collecting pollen and particulates and some models may release ozone into the air). Leave the “fresh air vent” in your car closed and turn on the “recirculating air” button to prevent pollen, dust and smog from entering in. Windy days can exacerbate or trigger allergies, have play dates inside with board games and art projects instead. Teach your child to blow his or her nose effectively and apply un-petroleum jelly around the nostrils to prevent redness and chafing. Rinse nasal passages with a mild saline solution using a nasal rinse pot (neti pot) after work or school and outdoor activities. Wipe down your loving pets with a damp paper towel to remove the pollen and particulates from their coats before re-entering your home. Although allergy remedies are necessary at appropriate times, prevention and lifestyle change is key for a healthy family all year round. https://drsusanne.com/wp-content/uploads/2014/01/Screen-Shot-2014-01-30-at-8.51.54-AM.png 456 1112 Dr Susanne https://drsusanne.com/wp-content/uploads/2018/04/logo-sample-300x100.png Dr Susanne2015-04-26 08:54:222015-05-02 16:56:05Natural Allergy Survival Kit! 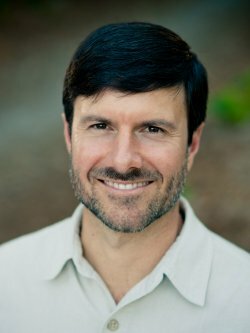 Tom Malterre is an advanced Functional Medicine trained nutritionist with over 10 years in clinical practice. He has two nutritional science degrees from Bastyr University and, along with his wife Ali, has authored three books including their most recent book, The Elimination Diet. In his free time, Tom loves to wild harvest roots, shoots, and fruits in the mountains with his five children. Learn more about the Elimination Diet here. Everyday Americans struggle with the management of daily stress. Over time, these stressors can lead to serious health problems such as high cholesterol, strokes and even heart attacks. Elimination of stress is not realistic, but learning how to manage stress is. 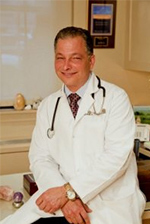 Dr. Jim La Valle author of the Metabolic Minute remains one of the most prominent wellness experts in the nation. Dr Jim La Valle will discuss ways to avoid, manage and reverse the negative health effects of stress plus how to keep your metabolism healthy so that you can fight disease. 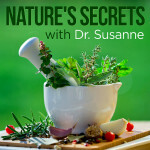 This week on Nature’s Secrets: Find out various different natural cleanses and how to pick which one is right for you. Read my latest blog post on cleanses here. Dr. Orlando Gutiérrez, M.D., M.M.Sc. 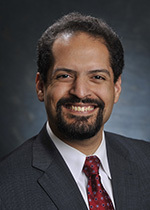 Orlando M. Gutiérrez, M.D., M.M.Sc., obtained his medical degree from the University of Toledo College of Medicine in 2002. Dr. Gutiérrez’s research is focused on understanding pathophysiological mechanisms underlying disorders of phosphorus and vitamin D metabolism in health and in individuals with kidney disease. He has a special interest in delineating environmental and/or behavioral factors that may modulate these associations, particularly those related to poverty and nutrition. His research has been published in high-impact journals such as the New England Journal of Medicine and Circulation, and he has been an invited speaker in numerous national and international conferences. What's Trending in Health Apps? As a new diets #trend every day, from juicing to paleo to macrobiotic, it seems that everyone is looking for a quick fix, often sacrificing a wholesome and nutritious lifestyle for shortcuts. Luckily, with the limitless smartphone power in the palm of our hands, it’s easier than ever to track of all of the different elements of a healthy life. This March, in honor of National Nutrition Month we’ve gathered the top must-have health and wellness apps that actually make it easy and dare we say it… fun…. to eat healthy and workout. Mac Gambill co-founder and CEO of Nudge, is an entrepreneur who has experience in the technology and fitness industries. Hailing from a background in semi-professional sports and technology, Mac decided to found Nudge in order to help people lead healthier lives. The health tech company offers insight into individuals’ lifestyle choices by curating and analyzing data from health and fitness apps and wearables and providing a simple, and unified feedback system to users. Phil Beene is an entrepreneur, former semi-professional athlete and healthcare enthusiast. Previously to Nudge, Phil worked at Maxim Healthcare where he worked with a team managing care services and personnel for clients with intellectual and developmental disabilities and their families. 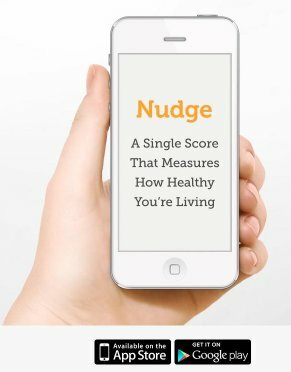 Nudge offers insights into individuals’ lifestyle choices by curating and analyzing data from health and fitness apps and wearables, and providing a simple unified feedback system to users. 21 Things You Need to Know About Diabetes and Your Heart by certified diabetes educator and dietitian Jill Weisenberger is a succinct and straightforward guide to managing diabetes and heart health. She will help readers understand that through consistent lifestyle choices, including food, exercise, and education they can make positive changes that will equal optimal diabetes management and heart health. Throughout the book, Weisenberger digs deep into the lifestyle choices that affect your heart and breaks down challenging topics into achievable actions that are easy to understand, simple to implement, and ultimately empowering to all. Jill Weisenberger, MS, RDN, CDE, FAND, is the author of Diabetes Weight Loss–Week by Week and The Overworked Person’s Guide to Better Nutrition. Jill contributes articles to a variety of publications, including The Diabetes Experience, Diabetic Living, and Kids Eat Right. 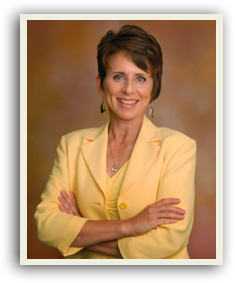 She lives in Yorktown, Virginia, and has a private practice in nearby Newport News. Traditional vital signs are a good start to assessing your health, but there are many more observations and evaluations that can be done routine at the doctor’s office or at home. 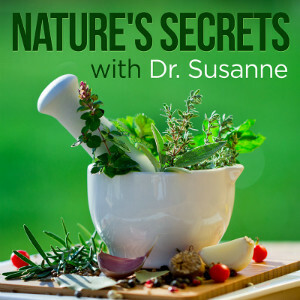 On Nature’s Secrets, Dr. Susanne will go over tongue diagnosis, fingernail and stool analysis which can reveal a good deal about a person’s overall health, habits and even their anxiety level. Physical examination is key to early detection of nutrient deficiencies and future illnesses. Mel Abraham is the founder of Business Breakthrough Academy and Thoughtpreneur Academy where he helps entrepreneurs bring their businesses to the world and build the lifestyle that they want. Mel is one the most sought after entrepreneurial mentor and strategic thinkers of our time. Unlike many other so called “business coaches”, Mel has lived everything he teaches and continues to do so. Mel is a true believer in the entrepreneurial way of life and says that this “new frontier” is the paradigm that will shift society from simply existing to living life bigger, bolder and on their own terms. Learn more about how you can get his free book, The Entrepreneur’s Solution, here. Sister Jenna is an award-winning spiritual leader, author, radio and TV personality, renowned speaker and founder of the Meditation Museum in metropolitan Washington, D.C. She has traveled to over 80 countries where she continues to provide practical life tools and solutions that empower people to foster and build stronger relationships. 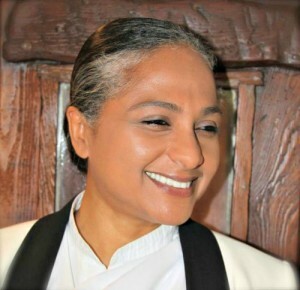 Her wisdom, peace, and compassion for humanity are expressed through the variety of initiatives she spearheads for youth, women, governments, and communities and through her syndicated radio show, America Meditating. Learn more here. the top safe supplements to improve your sleep quality without causing drowsiness or other side effects.